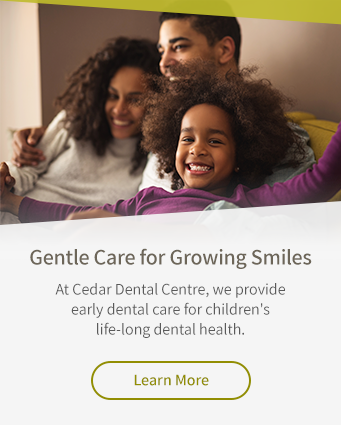 The dentists at Cedar Dental Centre in Kamloops provide fluoride treatment for children and adults to strengthen tooth enamel and protect teeth from decay. What is Fluoride Dental Treatment? Fluoride is a naturally derived mineral that helps make teeth more resistant to decay. Fluoride treatments at the dentist's office can prevent or even reverse tooth decay by re-mineralizing the tooth enamel. Why might I need fluoride treatment? The dentist may recommend fluoride treatment for adults who are at a higher risk of developing cavities, and for children, to help their teeth grow strong. Dental fluorosis (white spots on the teeth) may occur when too much fluoride is consumed in early childhood. It very uncommon, and not a concern for most children. Consult with your dentist when your child is under the age of three to find out if your child has a higher risk of tooth decay or cavities. If so, fluoride treatment at the dentist's office is often a good choice.